BMW has added two new models to the X3 range in the shape of the higher specification xDrive30d and xDrive35d priced from £37,600 and £40,205 respectively. Both are powered by the same 3.0-litre diesel engine and come with an eight-speed automatic gearbox as standard. 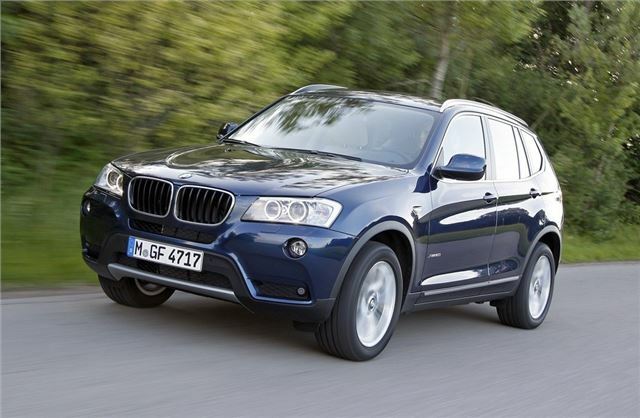 The X3 xDrive30d developes 258PS and 560Nm of torque which means it can accelerate from 0-62mph in 6.2 seconds. Despite these impressive performance figures official average economy is still 47.1mpg along with relatively low CO2 emissions of 159g/km. But it's the xDrive35d model which really catches the eye. The top model in the X3 range produces 313PS along with a mighty 630Nm of torque and as a result covers the 0-62mph sprint in just 5.8 seconds. However, it's likely to be the in-gear performance which will be the most impressive and useful aspect in everyday driving. It's still economical too - helped by BMW's EfficientDynamics system which means it averages a claimed 46.3mpg with emissions of 162g/km. Both X3 models also get enhanced specifications complete with metallic paint, the eight-speed automatic transmission and Dynamic Stability Control with extended features. The enhanced DSC includes brake drying, brake fade compensation, brake pre-tensioning and hill-start assistant. Additionally the X3 xDrive35d SE comes with 18-inch V-spoke light alloy wheels and a Sport leather steering wheel, while the M Sport model adds the Sport automatic transmission and M Leather steering wheel with gearshift paddles. The X3 xDrive30d is available with prices starting from £37,600 OTR for the SE and £39,975 OTR for the M Sport, while the X3 xDrive35d SE cost from £40,205 OTR and from £42,225 OTR for the M Sport.